For those not familiar with the salmon fishing seasons on the Kenai River we are going to give you a quick primer. On this page we highlight the when’s and why’s to the key months for planning your trip to Alaska. So if you’re hopping to cash in on the best months for Salmon fishing on the Kenai River, please read on. Best time to go fishing in Alaska. May through September, something is always jumping in the Kenai. We start off our spring king salmon fishing season with the early run of King Salmon, also known elsewhere as Spring Chinook. This run starts arriving around the second week of May and often is led in by some really nice fish. May is a great month to come if you really want some solitude to your fishing experience. Many of the non resident guides have yet to arrive for the season. Even the resident guide services are just beginning to get their boats ready come mid month. This is in no way a reflection on the fishing but relates more to the types of services that are being offered. Check our Kenai River salmon run timing chart below for more details. June continues with more spring king fishing as the runs build and the trailers begin to fill the parking areas. As spring transitions into summer the fishing slows while we wait for the second run to arrive. This can be a few days or even a week but all the time there are stragglers from the early run being mixed with the early arrivers from the second run. 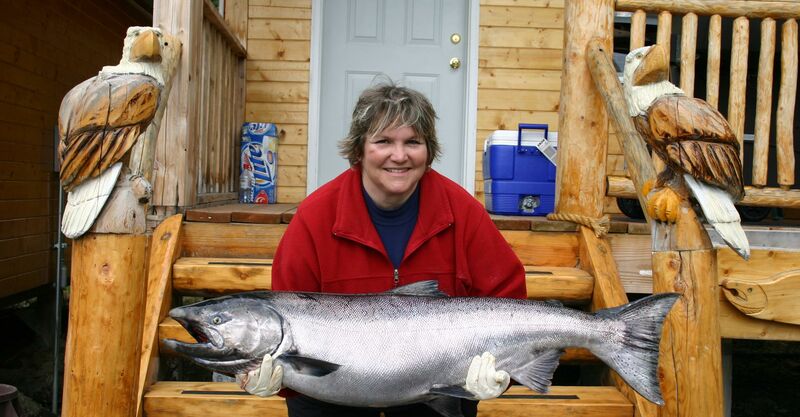 Salmon fishing on the Kenai in June goes through warm and cool spells making your guide very important in knowing where and how to find the fish on a regular basis. July is the month referred to as king fishing madness. The second run of Kings has arrived and everything is in place to make your fishin trip a real success. Warn weather, lot’s of fishing choices and long summer days that extend your time on the waters. Check our Kenai River salmon run timing chart below for more details. Among locals, July is notorious for the fill the freezer fishing frenzy that accompanies the return of the Kenai River wild and crazy sockeye salmon fishery. Just imaging, last summer on July 17th, 230,643 sockeye, that’s nearly a quarter of a million fish, entered the river on that one day alone. How many rivers can make that claim? What makes it really spectacular is the size of the river, this is no Columbia or Yukon size river by any means. If you need a Kenai River sockeye fishing guide give us a call. August on the Kenai is coho time. Schools of silver salmon really begin to pile up in the lower reaches of the Kenai River. following them in are the sea-run Dolly Varden (Char) that also make a fine quary for light tackle fishing. August and September are the months for the popular triple header action of Silver Salmon, Rainbow Trout and Dolly Varden. Check our Kenai River salmon run timing chart below for more details. Rainbow, Dolley Varden, Silver salmon and a combo of all three. September continues with plenty of action from wave after wave of Silver Salmon making their way to the spawning beds in the upper reaches of the Kenai. September is also the time to really hammer in on the trophy rainbow trout of the Kenai River Special Management Area. We are one of the lucky few that have the permits necessary to legally fish in theis special management area of the Kenai watershed. October is the month for spectacular rainbow trout fishing in our favorite fishing holes where 20 to 25 inch rainbows are the norm. There is still plenty of action with the Silver Salmon in the lower and middle river but the emphisis is on the rainbow and char fishing with silvers as an added bonus. So give us a call and let’s talk fishing on a more personal basis. With over 20 years in the business, we have many options available to us that will make your Alaska fishing trip a extraordinary success.